Prior to the availability of anti-D immunoglobulin (anti-D Ig), the incidence of Rh D alloimmunisation in D negative women following two deliveries of D positive, ABO-compatible, infants was approximately 16%, and haemolytic disease of the fetus and newborn (HDN) due to anti-D was a significant cause of morbidity and mortality (Urbaniak & Greiss, 2000). Following routine post-partum administration of anti-D Ig, the rate of alloimmunisation dropped to approximately 2%. A further reduction in the sensitisation rate ranging from 0·17 to 0·28% was achieved by introducing routine antenatal prophylaxis during the third trimester of pregnancy (Tovey et al., 1983a,b; Huchet et al., 1987; Mayne et al., 1997; MacKenzie et al., 1999). Associated with this reduction in sensitisation is a reduction in mortality associated with HDN, from 46/100 000 births to 1·6/100 000 births (Pilgrim et al., 2009). These findings contributed to the National Institute for Clinical Excellence (NICE) recommendation that all D negative pregnant women who do not have immune anti-D, should be offered additional routine prophylaxis with anti-D Ig during the third trimester of pregnancy (NICE, 2002, 2008). OBJECTIVES The objective of this guideline is to provide healthcare professionals with practical guidance on the use of anti-D Ig as immunoprophylaxis to prevent sensitisation to the D antigen during pregnancy or at delivery for the prevention of HDN. BCSH Guideline published for the use of anti-D immunoglobulin for the prevention of haemolytic disease of the fetus and newborn. The BCSH has released an amendment to the original guideline document that discusses anti-D prophylaxis in overweight women and provides a clarification of the recommendations regarding anti-D prophylaxis following intrauterine death (IUD). Following potentially sensitising events, anti-D Ig should be administered as soon as possible and always within 72 h of the event. If, exceptionally, this deadline has not been met some protection may be offered if anti-D Ig is given up to 10 days after thesensitising event (Grade 1C). In pregnancies <12 weeks gestation, anti-D Ig prophylaxis (minimum dose 250 IU) is only indicated following an ectopic pregnancy, molar pregnancy, therapeutic termination of pregnancy and in some cases of uterine bleeding where this is repeated, heavy or associated with abdominal pain. A test for fetomaternal haemorrhage (FMH) is not required (Grade 2C). For potentially sensitising events between 12 and 20 weeks gestation a minimum dose of 250 IU should be administered within 72 h of the event. A test for FMH is not required (Grade 2C). For potentially sensitising events after 20 weeks gestation a minimum anti-D Ig dose of 500 IU should be administered within 72 h of the event (Grade 2C). Appropriate tests for FMH should be carried out for all D negative, previously non-sensitised, pregnant women who have had a potentially sensitising event after 20 weeks of gestation, and additional dose(s) of anti-D Ig should be administered as necessary (Grade 1C). All D negative pregnant women who have not been previously sensitised should be offered routine RAADP either with a single dose regimen given around 28 weeks, or two dose regimen given at around 28 and 34 weeks (Grade 1B). It is important that the 28-week sample for blood group and antibody screen is taken prior to the first routine prophylactic anti-D Ig injection being given. This forms the second screen required in pregnancy as stated in the British Committee for Standards in Haematology (BCSH) Guidelines for Blood Grouping and Red Cell Antibody Testing during pregnancy (Grade 2C). The RAADP scheme should be regarded as supplementary to any anti-D Ig administered for sensitising episodes listed in Table 1 in the original guideline document (Grade 2C). Following birth, ABO and rhesus (Rh) D typing should be performed on cord blood sample and if the baby is confirmed to be D positive, all D negative, previously non-sensitised, women should receive at least 500 IU of anti-D Ig within 72 h following delivery. Maternal samples should be tested for FMH and additional dose(s) given as guided by FMH tests (Grade 1B). If there is an intrauterine death (IUD) and hence no sample can be obtained from the baby, prophylactic anti-D Ig should be administered to D negative, previously non-sensitised women. A minimum of 500 IU of anti-D Ig should be administered within 72 h following the diagnosis of IUD. Maternal samples should be tested for FMH and additional dose(s) given as guided by FMH tests. It should be noted that the diagnosis of IUD is the sensitising event rather than delivery and hence anti-D Ig should be administered within 72 h of diagnosis (Grade 2C). If cord blood sample cannot be obtained or if cord blood group cannot be established for any reason, at least 500 IU anti-D Ig should be administered to D negative, previously non-sensitised women (Grade 2C). Where intra-operative cell salvage (ICS) is used during Caesarean section in D negative, previously non-sensitised women, and where cord blood group is confirmed as D positive (or unknown), a minimum dose of 1500 IU anti-D Ig should be administered following the re-infusion of salvaged red cells, and a maternal sample should be taken for estimation of FMH 30 to 45 min after reinfusion in case more anti-D Ig is indicated. It is important that clinicians inform the transfusion laboratory if ICS has been used to ensure that correct dose of anti-D Ig is issued (Grade 2C). 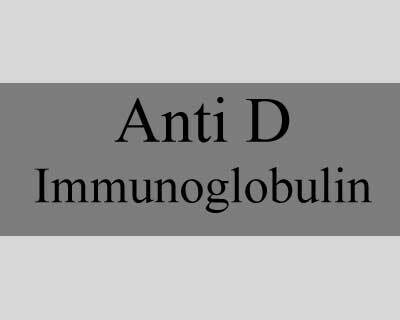 Adequate records of issue and administration should be maintained to allow full traceability of anti-D immunoglobulin (Grade 2C). Where anti-D is detected in a sample from a pregnant woman, further history should be obtained and investigations undertaken to establish whether this is immune or passive. If no clear conclusion can be reached as to the origin of anti-D,then prophylaxis should continue to be administered in accordance with guidelines for D negative women who have not formed immune anti-D (Grade 2C). Definitions for the quality of the evidence (A–C) and strength of recommendations (Strong [Grade 1], Weak [Grade 2]) are given at the end of the “Major Recommendations” field.